Transform your iPad or Android tablet into a digital canvas with Nomad Brush, a touchscreen-compatible bristle brush that works with free downloadable painting apps. 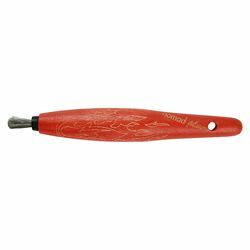 Hand-crafted using precision-milled parts, the Nomad Brush features a tip composed of a blend of natural and synthetic fibers offering a friction-free stylus experience. The soft rubber ferrule on the Nomad Play will never scratch the screen, and the bristles are durable, ensuring that children will have fun with Play for hours on end! Inspire your little Picasso! Tablet not included.